Successfully Added HK Warehouse Nomu S20 Rugged Smartphone - Android 6.0, IP68, Dual-IMEI, 4G, Quad-Core CPU, 3GB RAM (Silver) to your Shopping Cart. 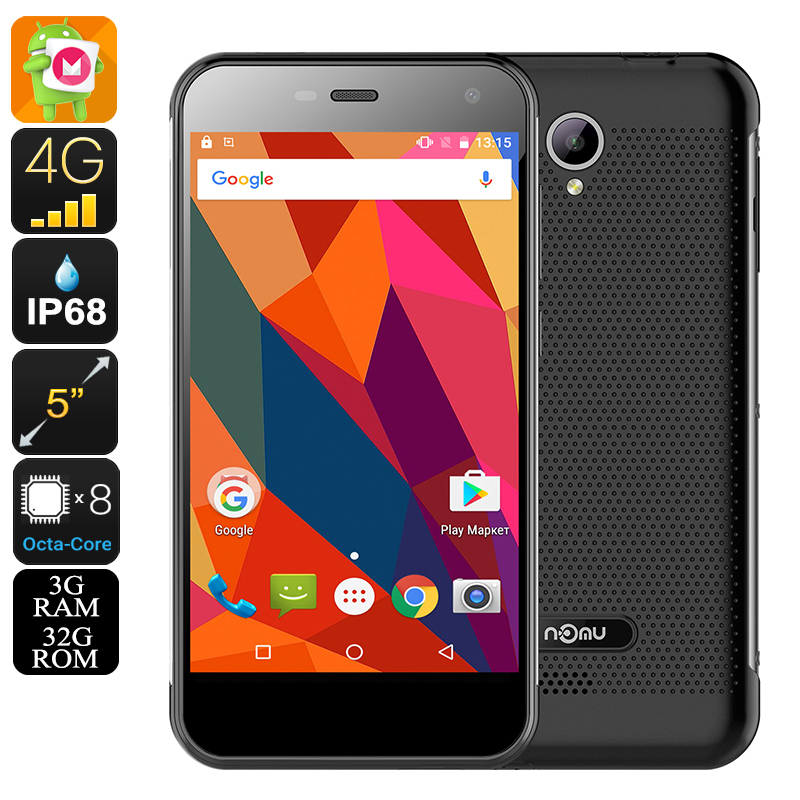 The Nomu S20 is a fully rugged smartphone that runs on an Android 6.0 operating system. Its beautiful 5 Inch HD display lets you enjoy movies and games in stunning quality. Portraying vivid colors and delivering a wide viewing angle, this Android phone truly lets all your media come to life in the palm of your hand. With its 3000mAh battery, you’ll be able to head out and enjoy all your phone has to offer for 5 hours continuously – providing you with enough juice to get through a day filled with media and entertainment. This IP68 rated smartphone is fully resistant against water, dust, and drops – making it an extremely durable device that can be carried around anywhere you go. Built to withstand the toughest of environments, this Android phone can handle whatever you throw at it. Even its 5 Inch display has been covered with Gorilla Glass 3, protecting it from breaking and scratching. Coming with an abundance of sensors, the Nomu S20 smartphone is the perfect gadget to have at hand during your upcoming outdoor adventures. With its 3GB of RAM this Android phone provides you with a platform that is fully capable of handling the most demanding multitasking sessions. Backed up by a powerful Quad-Core CPU you will be able to enjoy the latest games, movies, and mobile applications without needing to worry about slowing down your device. Providing you with 32GB of internal memory and an additional 32GB of external storage, the Nomu S20 is a smartphone that offers plenty of space for you to store all your files and media. Supporting two IMEI numbers, this Chinese smartphone fully enhances your connectivity by allowing you to be connected to two different network providers at the same time. Allowing you to be reachable on two different phone numbers while using just one device, makes the Nomu S20 rugged phone the perfect smartphone on which to efficiently separate your work and private life. Dual-Band Wi-Fi support furthermore ensures that you’ll always be able to enjoy the fastest data speeds out there, letting you browse the web in lightning speeds. Being able to enjoy the fastest data speeds let you to stay connected with your colleagues, friends and family no matter where you are. The Nomu S20 comes with a 12 months warranty, brought to you by the leader in Android smartphones as well as wholesale electronic gadgets..
Arabic: - IP68 الوعرة الهاتف الذكي - Chinese Simplified: - IP68 崎岖的智能手机 - Czech: - IP68 Odolný Smartphone - Dutch: - IP68 Ruige Smartphone - French: - IP68 Smartphone robuste - German: - IP68 Robustes Smartphone - Hebrew: - IP68 החכם מחוספס - Hindi: - IP68 बीहड़ स्मार्टफोन - Hungarian: - IP68 Egyenetlen Smartphone - Italian: - IP68 Smartphone Rugged - Japanese: - IP68 頑丈なスマート フォン - Korean: - IP68 견고한 스마트폰 - Malay: - IP68 Telefon pintar lasak - Norwegian Bokmål: - IP68 Barsk Smartphone - Romanian: - IP68 Rugged Smartphone - Russian: - IP68 Прочный смартфон - Spanish: - IP68 Resistente Smartphone - Thai: - IP68 สมาร์ทโฟนที่ทนทาน - Turkish: - IP68 Engebeli Smartphone - Vietnamese: - IP68 Điện thoại thông minh gồ ghề.